Door Glass – Houston auto door glass specialists offering quality auto door glass installation, repair and replacement services at discount prices. We replace, install, repair and service all door glass for all vehicles makes and models. We guarantee the lowest prices in Houston Texas. Call us at 713-401-9804 today to see how much we can save you on new auto door glass installation, repair and service. We repair all car door glasses on all vehicles – All Makes and Models! You won’t get a better deal! Guaranteed. Call us today. Insurance assistance – We deal with your insurance company for you. We provide car rental assistance – We arrange car rental for you. Chevrolet, Buick, Pontiac, Oldsmobile, GMC, Cadillac, Ford, Geo, Mercury, Lincoln, Chrysler, Plymouth, Dodge, Nissan, Hyundai, Daewoo, Hummer, Kia, Isuzu, Honda, Daewoo, Infiniti, Land Rover, Lexus, Acura, BMW, Jeep, Mazda, Mercedes-Benz, Mitsubishi, Saab, Suzuki, Saturn, Toyota, Volvo and, VW. A window regulator is electric or manual, and it basically controls the up and down motions of a side door window on a car. Window regulators and motors, located within car doors, help raise and lower windows of the vehicle. Since we use our windows frequently, window regulators and window motors are some of the most actively used parts in any vehicle. For this reason, window regulators and window motors are subject to high wear and tear that lead to breakage and inconvenience. Galleria Glass, your Houston auto door glass specialist repairs, replaces and services all door glass for all vehicles. We have been doing so for over 50 years. Call us at 713-401-9804 and we will repair or replace your vehicle windows regulator. We guarantee lowest prices on vehicle door glass in Houston Texas. The most common cause is a bad power window’s motor, the switch could be faulty or the regulator could be binding or the cable could be off one of the pulleys. Rarely, windows may just be stuck in the weather stripping (called a run) and need to be freed up and the guides lubricated with silicone spray. Our master auto technicians have repaired literally hundreds of power windows in nearly all makes of cars over the years. In this how to article I’ll let you in on some things to look for when diagnosing power windows not working. Ninety percent of the time, these type of problems can be diagnosed in less than sixty seconds! If the windows or auto door glass moves a few inches and stops, then the motor is allowed time to cool down and will again move a few inches; the power motor will need to be replaced. If there is no sound coming from the motor, it may not be getting power or the motor itself may have an open circuit. Checking for power to the window’s motor normally requires removing the door panel to access the wiring. After access to the power window wiring is gained, a test light or meter can be used to see if it is getting power and ground. We’ve learned over the years a short cut that saves the hassle of removing the door panel for testing the motor. Most of the time when checking this problem, just turn the headlights and interior lights on; look for a slight dimming of the interior or dash lights when the power window switch is pushed. If a slight flicker or dimming of the interior lights occur, this indicates that the switch is functional and the motor is bad. Try this with one of the power windows that is working to gauge the affect on the interior lights. If there is no change in the brightness of the interior lights when trying this with the inoperative window, the switch could be bad. Auto windows don’t normally just go off track (the regulator fails causing it to move out of the normal position). If the window appears to be off track, the regulator has most likely failed. Window regulators either use metal gears (which rarely fail) or they use a cable and plastic pulley design – which commonly fail. If the window has fallen, the regulator will most likely need to be replaced. If the glass is cocked unevenly and is binding, the regulator has most likely came apart. The motor will be heard when pushing the switch in many cases but the window won’t work correctly due to the failed regulator. Auto window regulators and motors, located within car doors, help raise and lower windows of the vehicle. Since we use our windows frequently, window regulators and window motors are some of the most actively used parts in any vehicle. For this reason, window regulators and window motors are subject to high wear and tear that lead to breakage and inconvenience. Some of the common reasons for window regulator and window motor failure(s) include excessive strain and breakage caused by forcing the window, damaged window track, old or worn pulley and cable lines, and general wear and tear. Therefore, the quality of the design and material is important to the reliability of the window regulator and motor. 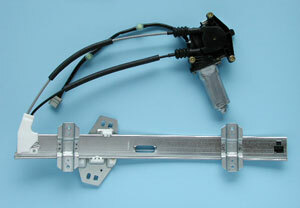 The switch is the assembly that applies power to the window motor. Depressing the switch applies voltage to the motor causing it to move. Depressing the switch in the opposite direction causes the motor to turn in the opposite direction. Window switches can be a group of buttons (commonly found on the front driver’s side door) or a single switch. Window switches can also be grouped with power door lock switches and be console or dash mounted. These are small individual components of the power window system such as rollers, window guides, motor gears, and drive tapes. Use and availability of these individual parts varies between manufacturers and applications. Many times all that is needed to repair the power window is one of these small parts. Does your window slide down while you’re driving? Or maybe your window works when it wants to, or doesn’t work at all! Call us today at 713-401-9804 to service your door glass repairs! Galleria Auto Glass © 2019.